They got the cart and the children moved to the shade under the lip of the roof of a low building squatting between the water treatment plant’s pools. Of course, they had to share the space with dozens of other dogs, coyotes, jackals, and dholes, lying down or sitting up, scratching themselves, grooming each other. The air was full of soft yelps, whines, and growls. 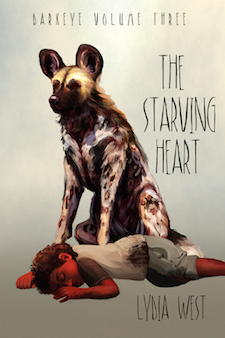 Mhumhi felt that they were still getting their share of stares and blunt curiosity, but for the moment the mood of the amassed dogs seemed more weary than anything else, and more prone to staring out at the burning city. The fire was still going, though it seemed to be expanding in other directions now, away from the plant. Hot wind would still occasionally blow smoke and ash their way, igniting everybody into explosive bursts of coughing. Mini tore apart more pieces of cloth instructed Kutta and Mhumhi to get them wet and place them over the mouths and noses of Maha and Tareq. Mhumhi knew they were all due for a rest, particularly poor Vimbo, who had outright laid down and gone sound asleep with his big head lolling on his paws. But he still felt the time ticking away. It was not just his own sense of urgency- at any moment the winds could shift and push the fire back their way again, and even if the pools of water would protect this area from being burned it wouldn’t stop the fire from surrounding them, shutting them in, along with all of the other dogs. He was pacing a tiny circuit, stalking the few steps it took to go back and forth in front of their tiny little space. Kutta rose from where she had been lying down and pushed against him a little to stop him. “I have too much energy,” said Mhumhi, which was sort of the truth- he was extremely tired, yes, but still filled with a kind of frenetic desire to move. “You’re panting and you’re limping again,” Kutta pointed out. “I’m not limp-” started Mhumhi, and then realized that he was holding his back leg, with its old pink scar, off the ground where he stood. Kutta nuzzled at him, pushing him more and more insistently until he lowered his quivering hindquarters into a seated position. He jumped back to his feet, and Kutta gave a squeaking growl- so much for calm and gentle. They were being approached by a pack of dogs- little dogs- more Mini’s size, threading through the startled legs of coyotes and jackals alike. Mhumhi swallowed. It was a pack of bush dogs. “Are you police?” said the leader, adding in a shrill squeal for good measure. The rest of them fanned out, their tiny ears cocked and their little bears’-faces deadly serious. Mhumhi hesitated, lower jaw hanging open, and looked at Kutta. She seemed similarly rattled, gazing at the lead female’s face. “Are you police or not?” the bush dog demanded, her small black eyes narrowing. “The city is on fire!” Mhumhi put in, raising his tail, but quickly lowered it again when the bush dog turned her glare on him. The bush dog said nothing, leveling her ferocious stare at the little domestic, who was about equal to her size. Mini seemed unperturbed, and hopped down with her tail wagging slowly. The bush dog suddenly jumped on her, grabbing the back of her neck so she shrieked. The others moved in with savage squeals, and in an instant Mini was on her back, yelping and crying, as they took vicious mouthfuls of her thick fur. “Stop that!” cried Mhumhi, aiming a snap at the squirming fray. A bush dog whirled and fastened itself to his chin, so that he jerked back with a yelp. Two more of them detached themselves from Mini and went for his ankles, fastening their sharp teeth to him, dragging his legs in two different directions. Kutta snarled and grabbed one of them around the fat middle with her jaws, yanking it back. It whirled around in her grip and snapped furiously at her face. Vimbo woke up with a grunt, raising his heavy head, and some of the bush dogs turned furious, fearful gazes towards them, and Tareq was peeking over the edge of the cart at the whole mess, and the coyotes and jackals around them were yapping and wagging their tails at what must have seemed hugely funny. Mhumhi did not share their humor- he could see that if Vimbo joined the fight it was going to get very bad, so he did the only thing he could think of. He flattened his ears, dropped to his belly, and whined loudly. The bush dog still worrying his leg hesitated, and the others looked at him. Mhumhi crawled over to where their leader was still harrying Mini and licked at her chin and mouth, whining, beating his tail against the ground. The leader grunted and gave kind of a garbled statement of protest, but Mhumhi kept licking at her, subtly pushing her mouth off and away from Mini as he continued to prostrate himself. Kutta stopped fighting with her bush dog attacker and stared at him, panting, as all the others were. The leader bush dog backed up a few stuttering steps, moving her head from side to side to try and get away from his ministrations, but he kept after her, rolling half on his side to paw at her, his big pads nearly the size of her whole head. She hesitated, for Mhumhi had flattened himself against the ground with his most puppyish expression in place. The other bush dogs seemed drawn over, and were sniffing curiously at him. Belatedly Kutta seemed to take a page from his book and lay down as well, putting her chin on the ground, though she kept her ears pricked. Vimbo put his head back down too, and Mini, who had twisted to her feet upon release, sank back downwards. Confusion flickered in the lead bush dog’s small eyes as she stared at Mhumhi. The bush dog hesitated, her jaw slightly open. Her packmates all turned their eyes on her. Mhumhi wagged his tail and started to creep closer again, but she backed up hastily. There was yapping and howling at this, and many of the dogs also submitted their own wagging, whimpering poses, and she seemed satisfied, and raised her short tail to lead her pack back and away from the lot of them. Mhumhi raised his head slightly to watch them retreat, all in a line, snaking through the crowd. Mini jumped back to her feet, looking none the worse for wear. “That was something, wild dog,” she said, and turned to lick at her mussed fur in an aggrieved way. He wasn’t sure if she was being sarcastic or not. “Something,” said Kutta. Mhumhi looked over and found her sitting up and staring out at the water of the long pool nearby. He suspected he knew what she was feeling, for all her stiff, inscrutable body language, and wavered for a moment, wondering if he should try to go comfort her. No, he decided, no, she would not want him too. Right? In his head he felt like slinking, tucking his tail, a guilty dog. The next moment his vision was filled by a black nose, as a coyote thrust herself t him, sniffing and wagging her tail, quite in his personal space. He went stiff with surprise, still laying down there in the dirt, but she seemed nothing but friendly. Other dogs were pressing closer along with her, even around Vimbo- Mhumhi saw one side-striped jackal crawl close enough to sniff at Vimbo’s short tail, then leap away when the hyena whirled around. Mhumhi’s pride, little of it that there was, felt mildly slighted by the coyote’s questions, but it would be stupid to show it now. He wagged his tail and whined rather than answering, licking her narrow chin. The coyote’s chest heaved, and much to his surprise she lowered her head and regurgitated a small mass of meat. “Eat that,” she said, licking her chops, and Mhumhi, more by instinct than anything else, snatched the meat and backed away, swallowing it in one gulp. The warmth of it sent a powerful tingle into his gut, flaring up the dormant processes of digestion and hunger. He should have saved it for the children, he realized, with a dim guilt. “You’re starving,” the coyote said pityingly. Another coyote stepped up beside her and hacked up more meat. “Oh,” said Mhumhi, staring at the meat. Mini’s bulging eyes passed across all of them, and then she sprang upon the meat with a little growl of hunger. “Why…” Mhumhi began, then stopped himself, afraid that voicing his confusion would take away the strange generosity they had received. The male coyote met his gaze for a moment. Mhumhi, startled, couldn’t stop himself from looking back at the burning city, and the coyote laughed. That did not make Mhumhi feel one bit better. He looked sidelong down at Mini, but she was still devouring her meat, bristling protectively over top of it. “We know all about being hungry,” said the female coyote. “Our dispensary failed at Zoo Park- yours did too, right? A bunch of us have been wandering around the city, trying to get meat at any dispensary we can. You can join us if you like…” She paused, looking around Mhumhi at the cart. “Ugh, I guess. I hope the dispensaries start working again soon, I’m so tired of all this.” She lowered her head with a little sigh, then looked up at him with her golden eyes. “And the others? They’re part of your- err- pack?” She peered around him again, eyes darting over the domestic, the dhole, the hyena, and the hulkers. “Well, I’m not police,” Mhumhi felt compelled to remind her again. She did not appear to hear him, for she was looking around him- there was a group of dholes moving forward through the crowd, tails wagging, looking at Kutta. Kutta, Mhumhi was a bit pained to see, had not fully recovered from her stiff silence from earlier, and now looked at the dholes with an expression of nervous misery. He hesitated, then left Telipa, walking with his head low, and stood next to her. The dholes stopped short. “What’s with you, spotty?” one called. Mhumhi was surprised to realize that he actually recognized them, in a misty way- they were the same band of males that had once gotten him and his sisters out of trouble underneath the concrete bridge in Oldtown. They seemed to be two or three less in number now, though, and a great deal more haggard-looking. “Don’t bother her,” he said, trying to sound more stern than aggressive. The lead dhole, Rakshasa was his name, rolled his eyes towards his followers. Kutta gave a sudden growl, and as a unit they all started and put their ears back. There was a sort of silence for a moment- the dholes’ eyes very wide- and then Rakshasa stepped forward again, wagging his tail in an appeasing way. Kutta merely looked at him with her chin thrust high and her eyes narrowed, quiet different from how cowed she’d been before. The male dholes were now all a-whimper, wagging and bouncing on their forepaws. This did not seem to be received well by the crowd, and Mhumhi saw many coyotes and jackals that had been sitting on their haunches stand up again, bristling. Telipa’s golden eyes were flashing. Kutta parted her lips slightly, just showing the white tips of her canines. Mhumhi tensed at this, but the dholes seemed much more confused than insulted, muttering amongst one another. Rakshasa had his lips wrinkled in a queer way, as if he’d just tasted something unpalatable. Her yellow eyes flashed up in annoyance at this. But before she could say anything, a golden jackal ran up, tail wagging, and hacked up a pile of meat. “I give this to the red dog- or not red dog- but I give it!” he cried, wagging so hard and so nervously he looked as if he might urinate on himself at any moment. Kutta looked surprised, but the way she slowly inclined her head seemed calculated. She ate the meat, right there in front of the dholes. The other dogs around them were starting to bark their derision at the insult, a forest of wagging gray tails. Mhumhi was not sure that this was the best idea, as many of the dholes had gone stiff-legged, and looked nervously at his sister, who was licking her chops. The dholes appeared to have a very short emergency conference, then one stepped forward. He coughed up another mound of meat. A few others joined him and added contributions to the pile, though not Rakshasa, who still had that bad-taste look on his face. “It would be better for you if you went with us,” he said to Kutta. “It would be best for you if you’d leave,” she replied, setting off another round of delighted yapping from the onlookers. One of Rakshasa’s brothers stepped forward, showing his teeth, but Rakshasa stopped him with a look. “If you want us to, we will,” he said, and with a swing of his brushy tail led his draggled pack away. The coyotes and jackals yipped and howled their glee, and several more came forward and spat up more meat, until there was quite a considerable mass of it sitting there before them. Mhumhi looked at her askance, and she burst into that loud laugh again, falling into a play-bow. “What’s the matter with them, exactly?” asked Mhumhi. Mhumhi looked over at Kutta, who was now perusing the pile of meat for the choice bits, and had to admit that she had indeed quite handled the situation. He gave Telipa a wag of acknowledgement and went back to his sister. “I suppose,” said Mhumhi, licking his lips. She broke off and they both observed Mini, who was speaking encouragingly in hulker to the hyena, who was sniffing the meat rather warily, his short tail raised over his back. This statement made Mini sneeze in consternation, but she did turn back to Vimbo and speak in a slightly firmer tone. The hyena turned his black eyes to her, then took a mouthful of meat. “Let’s feed the children,” said Kutta, tone much softer, tail whisking. They went back to the cart, scattering sniffing smaller dogs, and found Tareq halfway out already. “I’m hungry!” he proclaimed, and then lost his grip and tumbled backwards onto the dirt. Mhumhi and Kutta ran to him, but he seemed unharmed, and grabbed a handful of Kutta’s short fur to tow himself back up. Kutta winced. She broke off. Telipa was approaching, her tail wagging and her back somewhat arched. Tareq looked at her, then held out his hand. The fur on her back rose even more, but she kept her tail wagging, and stretched out to sniff at it, flinching at first, then becoming more enthusiastic, rearing up to sniff his face. Tareq gave a little giggle as her whiskers tickled him. Mhumhi not liking the increased intensity in her golden eyes, slotted himself in between the two, pushing Tareq a step sideways. “Go eat your meat,” he told him. “I like this dog,” Tareq protested, but Kutta took his hand gently in her mouth and led him forward. “They are very much like dogs,” Mhumhi said, making her give him a startled look. She did not know the half of what he was referring to. “Hey, Mhumhi,” said Mini, who was sitting in the shade underneath Vimbo’s legs. Mhumhi was somewhat glad to excuse himself from Telipa and go over to her. Mhumhi looked back over at the flickering orange engulfing the city buildings and saw that it did indeed appear to be shifting its path, slowly, glutted with the destruction it had already caused. It matched the hunger flaring up in his belly over the pile of meat. “Mini tore apart more pieces of cloth instructed Kutta and Mhumhi to get them wet and place them over the mouths and noses of Maha and Tareq.” and instructed? “When this fire clears up, you clear up!” you clear out?